If you’re a student dealing with the demands of study and exams then PINPOINT BRIGHT BRAINS may be your unfair advantage. If you want to improve your memory, concentration and focus, PINPOINT BRIGHT BRAINS may support you. 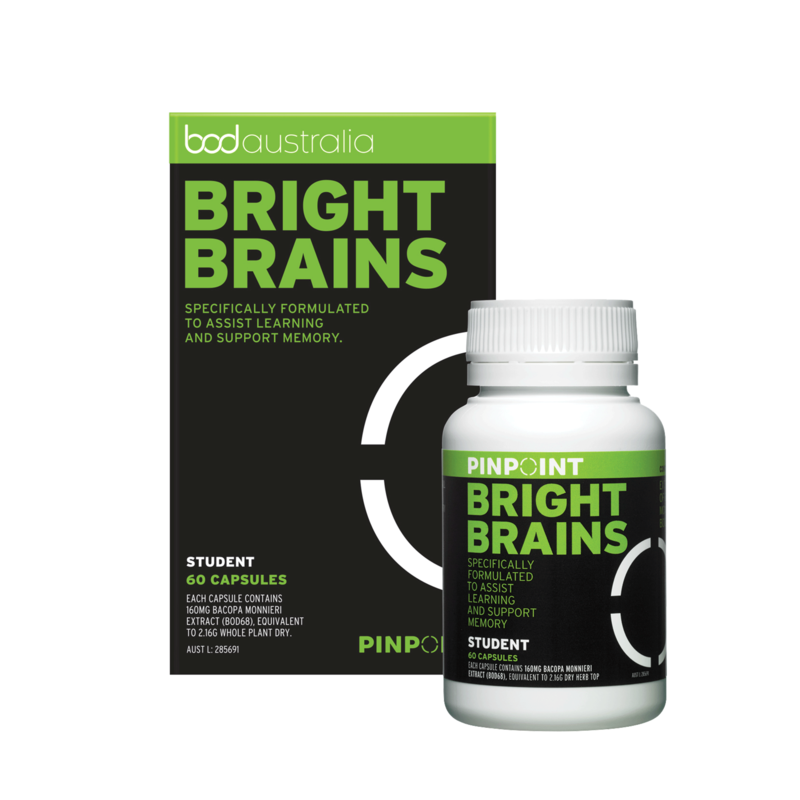 Pinpoint Bright Brains was developed to help enhance mental focus and cognitive function. In collaboration with leading scientists, health experts and formulation specialists, Bod Australia has developed a powerful and smart natural-based medicine (use ‘solution’ if medicine not allowed), designed to help you stay focused. PINPOINT BRIGHT BRAINS can support clarity, focus and enhanced memory function. Perfect for when you want to perform at your best or during stressful periods. Whether you’re a high school or university student or a professional in a busy career you could benefit from PINPOINT BRIGHT BRAINS. The specialised formulation uses a key ingredient traditionally used in Ayuvedic medicine for centuries to naturally improve memory and mental capacity as a brain tonic, supporting brain health and function. Our team of experts in beauty, health and natural-based medicines, search the world for the highest quality active ingredients. We apply evidence-based scientific rigour and clinical trials to ensure you get quality, consistency and effectiveness in all our products. We invite you to join us on our journey to bring ’Beautiful Science’ to everyone. PINPOINT BRIGHT BRAINS contains a specific extract of Bacopa monnieri (BOD68), a plant-based Ayurvedic medicine originally discovered in India over 2,000 years ago; numerous clinical trials have confirmed that it improves cognitive processes such as memory and speed of information processing in adults and children over 7 years of age. Bacopa monnieri is commonly known as Bacopa or Brahmi and known worldwide for its longstanding cognitive benefits. PINPOINT BRIGHT BRAINS works by supporting the nervous system and acting as a brain tonic. This means it can help with the way the brain and nervous system operate, especially during times of stress. Research continues to prove the direct impact stress has on brain function; this affects memory, clarity and learning. Taking PINPOINT BRIGHT BRAINS may help support your brain function and improve memory. BOD68, the unique extract of Bacopa monnieri only available in PINPOINT BRIGHT BRAINS, is phytochemically comparable to the Bacopa monnieri extract that has been meticulously researched in multiple scientific and clinical studies. This means you can be assured of the results and quality in taking PINPOINT BRIGHT BRAINS. Always read the label. Follow the directions for use and if symptoms persist talk to your doctor. Supplements should not replace a balanced diet. Take 2 capsules per day after meals. For best results PINPOINT should be taken regularly for at least 10 weeks. Each capsule contains Bacopa monnieri extract (BOD68), Equiv. to 2.16g (Dry Herb). standardised to 8mg Bacosides A.